3 impressions from Washington’s first defeat in nearly two months: Where do the Huskies go from here? The Huskies were pummeled inside by a punishing Arizona State front line that outscored them 42-20 in the paint and won the rebounding battle 40-23. TEMPE, Ariz. — Perfect no more. The Huskies lost their first Pac-12 game on Saturday night, a 75-63 defeat at Arizona State that snapped a 12-game winning streak. Washington (19-5, 10-1 Pac-12) still maintains a commanding three-game lead in the conference’s regular-season title race with seven contest remaining. Not sure if Arizona State unlocked some great mystery or exposed the Huskies in a way that’ll make them vulnerable to future opponents. Defensively, Washington did what Washington does. The Huskies took away ASU’s perimeter game (6 of 17 on three-pointers), forced 24 turnovers and kept the game within reach for most of the night. However, the Sun Devils had great success getting the ball into the high post, which is something most UW opponents are unable to do. And Arizona State has a versatile player in Zylan Cheatham, who is able to make good decisions in the high post. Other ASU players scored more points, but the 6-foot-8 senior forward was the game’s MVP. He finished with nine points, nine rebounds, seven assists, two blocks and two steals in 34 minutes. Cheatham also committed six turnovers, but he was a big reason why Arizona State shot 61.7 percent from the field, outscored UW 42-20 in the paint and won the rebound battle 40-23. 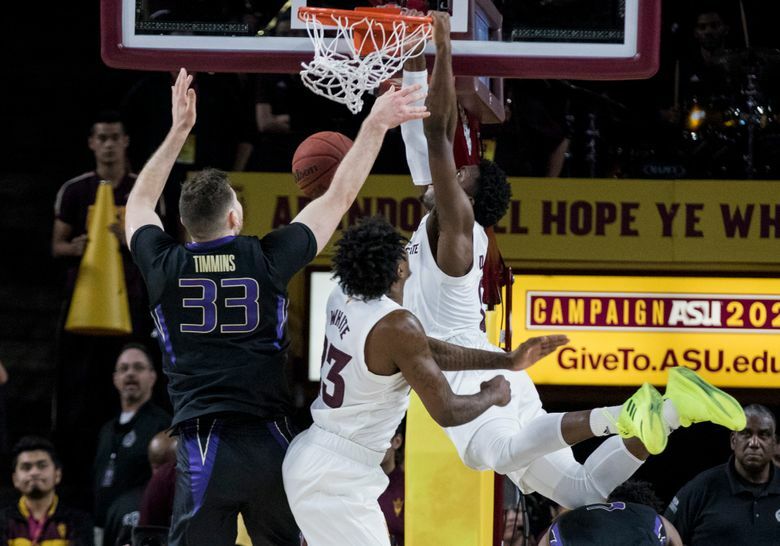 With Cheatham dishing, it led to a cavalcade of dunks for the Sun Devils, who finished with eight — three from Romello White (17 points), three from Cheatham and one each from Luguentz Dort (15 points) and De’Quon Lake. Among UW’s remaining opponents, only a handful of teams have a player like Cheatham who can hurt the Huskies. Oregon State’s Tres Tinkle, Colorado’s Tyler Bey and Washington State’s CJ Elleby are multidimensional players who can operate inside and be effective with their shot-making and passing. It’s unfair to pin a loss on one guy, but the Huskies could have used 6-9 Hameir Wright, who sat on the bench in uniform but missed his second straight game due to illness. Wright, UW’s second-leading shot blocker with 30 swats, gives UW another long defender to patrol the paint. Without him, the Huskies relied heavily on Sam Timmins and Noah Dickerson. Timmins had a couple of nice baskets early, but he wasn’t much of a defensive presence. Dickerson delivered a gutty performance (18 points and eight rebounds) considering he was saddled with foul trouble and still dealing with a sprained right ankle and estimates he’s between “80 and 85 percent” healthy. David Crisp scored 13 of his 17 points in the second half, but he hit 6 of 19 attempts — which typifies the Huskies’ offensive troubles. Arizona State also made life miserable for Jaylen Nowell, who had 15 points on 5-of-13 shooting. He was often forced to pass out of double teams on the perimeter and committed four of UW’s 17 turnovers. Dickerson, who made 5 of 7 field goals and 8 of 12 free throws, was the only UW player who was marginally effective on the offensive end. Matisse Thybulle was 1 of 6 shooting three points. Dominic Green finished with a career-high five steals but tallied just six points. And Nahziah Carter was scoreless on 0-of-5 shooting in 15 minutes off the bench. He was unable to get into a flow because of a few erratic substitutions. Washington shot 36.8 percent from the field — its second lowest of the season. Not surprisingly, the last time they were this bad, the Huskies lost their last game — a 73-61 defeat against Virginia Tech on Dec. 15. Still, Washington scored more points at Oregon — a 61-56 win — and was able to get the victory. It’s been so long since their last loss, so there’s really no telling how the Huskies will handle their first setback in nearly two months. Washington hasn’t lost consecutive games this season, but those early defeats were in the nonconference season and followed by winnable games against mid-majors. The Huskies have a relatively light week as their next game is Saturday at Washington Sate. They’ll take a couple of days off, which is good timing for Dickerson, Wright and a couple of players who are also dealing with an illness. But the Huskies will have their hands full in the next game against a Cougars team that did what UW was unable to do and won two games in Arizona. Not exactly sure how they did it, but the Cougars upset Arizona State 91-70 on Thursday before beating Arizona 69-55 on Saturday. WSU forward Robert Franks played a large role in both wins, scoring 34 points in both games. Obviously, the Huskies will need to contain Franks, who did not play in their first meeting — an 85-67 UW win on Jan. 5 at Alaska Airlines Arena.